Simon & Schuster, 9781501189876, 320pp. Michelle Lopez—the wildly popular and critically acclaimed blogger behind Hummingbird High—teaches busy people how to make cookies, pies, cakes, and other treats, without spending hours in the kitchen. If anyone knows how to balance a baking obsession with a demanding schedule, it’s Michelle Lopez. Over the past several years that she’s been running her blog Hummingbird High, Lopez has kept a crucial aspect of her life hidden from her readers: she has a full-time, extremely demanding job in the tech world. But she’s figured out how to have her cake and eat it too. In Weeknight Baking, Lopez shares recipes for drool-worthy confections, along with charming stories and time-saving tips and tricks. From everyday favorites like “Almost No Mess Shortbread” and “Better-Than-Supernatural Fudge Brownies” to showstoppers like “a Modern Red Velvet Cake” and “Peanut Butter Pretzel Pie” (it’s vegan! 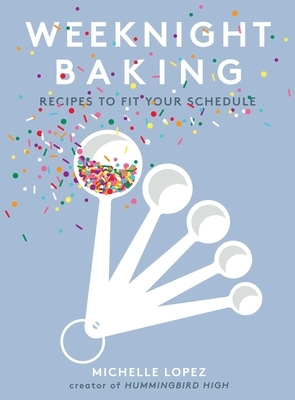 ), she reveals the secrets to baking on a schedule. With rigorously tested recipes, productivity hacks, and gorgeous photographs, this book is destined to become a busy baker’s go-to. Finally, dessert can be a part of every everyday meal!